The word poetry has been known to strike fear into many an adult’s heart, but it is something we can all have a go at and the more you do it the better you get. I always remember being told that a poem is simply ‘the best words in the best order’ and the only way to really fail at writing poetry is not to write at all. 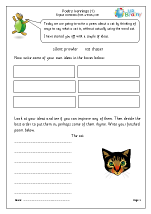 So, probably the hardest part to writing a poem is to get started and we have just produced a great set of starter ideas for young children. 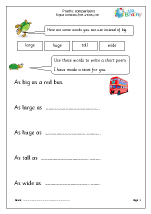 We begin with a series of comparison poems, using words meaning big, small, joyful and unhappy to write short lines. 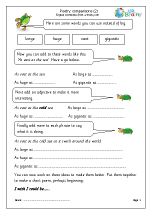 For slightly older children these ideas can be developed further, adding a descriptive phrase to each line. 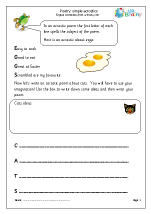 Kennings are also a great way to get started with writing poems. A kenning is a phrase which replaces a noun. It derived from Anglo Saxon times when warriors would describe their swords as ‘death bringer’ or ‘wound maker’ and consists of a series of two word lines to describe an object, person or creature. 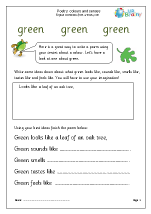 Other ideas we have just published include a set of pages on colours, thinking of things which are red, blue, green or black and using these ideas to create a short poem. 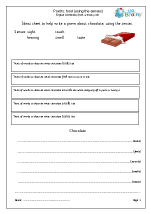 This is then developed further to include using the five senses to help describe colours. 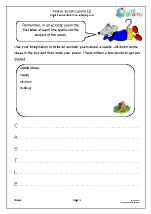 Finally we have a selection of an old favourite; acrostic poems, ideal for young children. 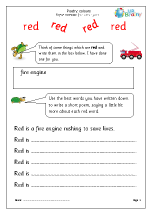 In an acrostic poem the first letter of each line spells the subject of the poem. Writing poetry is rather like beginning to run, you get better by ‘doing’ it. 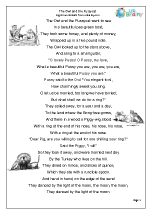 Certainly poems do not have to rhyme, although a great deal of fun can be had in creating rhyming poems, and a good dictionary or thesaurus can be really useful in finding those ‘best words’ before putting them into the ‘best order’.